Formula One cars have little in common with ordinary road cars, which is a problem for the automakers that pour millions of dollars into the sport every year, and the fans who watch these remarkable machines from the sidelines. Debuting at the 2018 Paris Motor Show, the Infiniti Project Black S hints at how F1 tech could make it into cars normal people can drive. 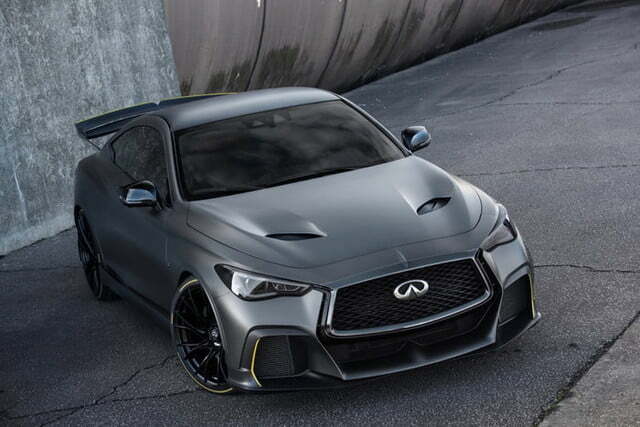 This is actually the second Project Black S Infiniti has shown. The first car, unveiled at the 2017 Geneva Motor Show, was a design study, but Infiniti claims this second car has some actual engineering behind it. 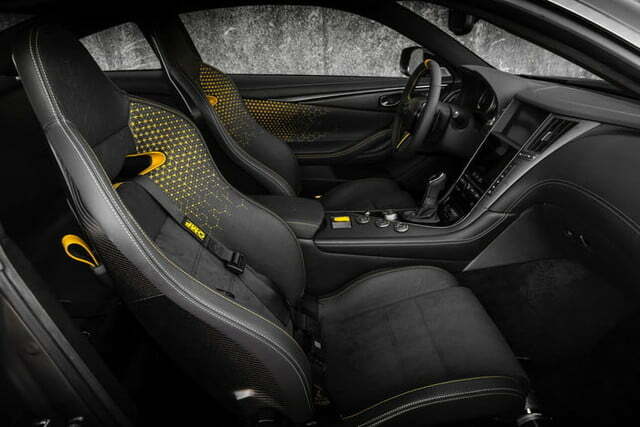 The Nissan luxury brand said the car was developed in concert with the Renault Sport F1 team. Renault and Infiniti parent Nissan are joined at the hip in a corporate alliance, and Renault’s F1 cars wear some Infiniti branding. 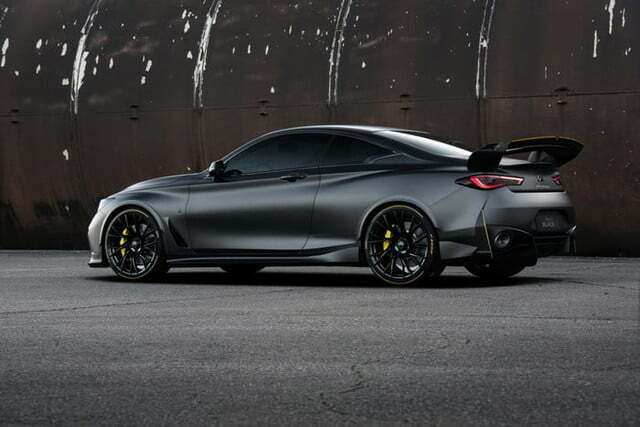 The Project Black S is based on the Infiniti Q60 Red Sport 400, and uses that model’s 3.0-liter twin-turbocharged V6. Infiniti and the Renault race team modified the powertrain to incorporate a hybrid system that, as in an F1 car, gets electricity from two sources. A “motor generator unit-kinetic (MGU-K)” harvests energy from braking, similar to the regenerative braking systems in production hybrids and all-electric cars. A special pair of turbochargers comprise the “motor generator unit-heat (MGU-H)” element, using heat from the exhaust to generate electricity. That electricity is stored in a 4.4-kilowatt-hour lithium-ion battery pack and can be used in two ways. It can spool up the turbochargers to make the gasoline engine more responsive, or power an electric motor that works with the V6 to turn the rear wheels. 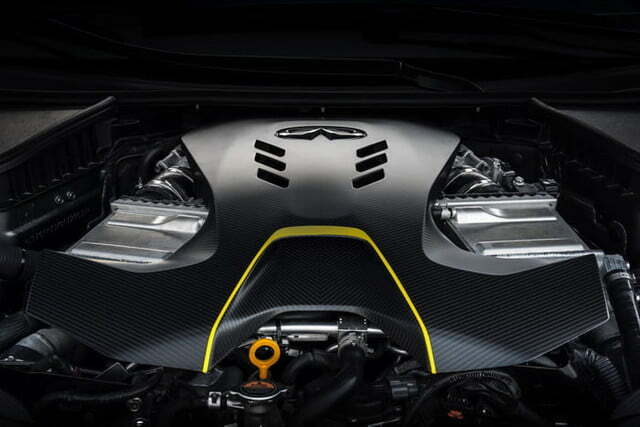 The hybrid system adds about 200 kilograms (440 pounds), according to Infiniti, so a diet that included replacing the stock steel hood, trunk lid, fenders, and roof with carbon-fiber pieces was instituted to counteract that. Having a lot of extra power helps too. The hybrid system adds 163 horsepower to the V6’s output, for a total of 563 hp. 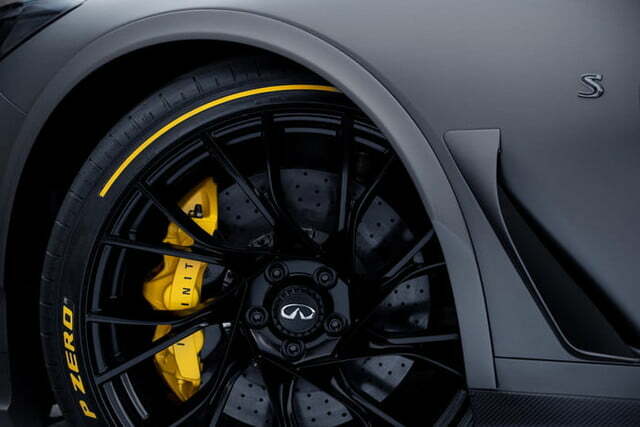 Infiniti estimates the Project Black S will do zero to 62 mph in under four seconds. 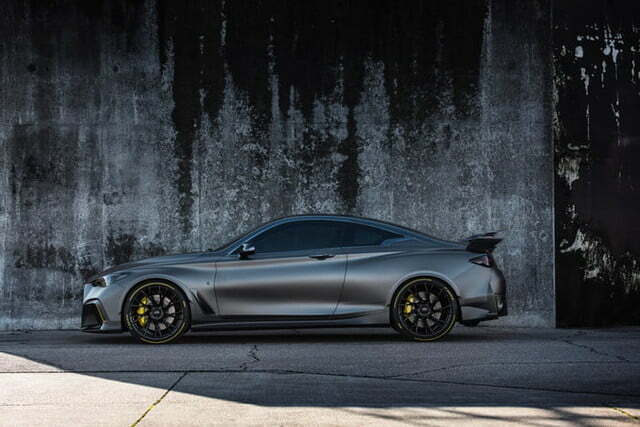 The stock Q60 seven-speed automatic transmission handles shifting duties. 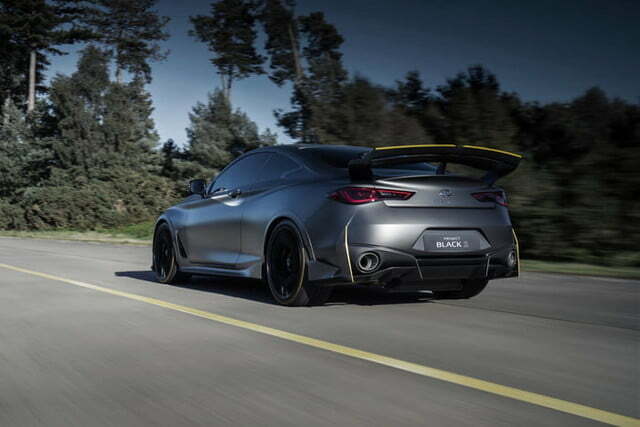 Aside from the powertrain, Infiniti made some modifications to the bodywork to improve aerodynamic efficiency. 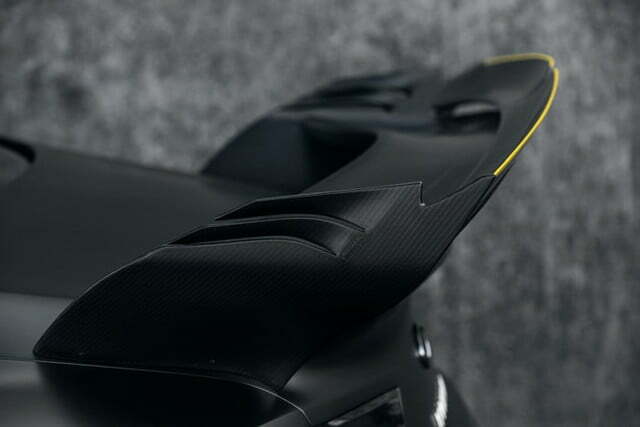 That included a rear spoiler modeled on the one used by the Renault F1 team at Italy’s high-speed Monza circuit. The race team gave designers access to digital modeling tools to fine tune all of the changes, Infiniti said. 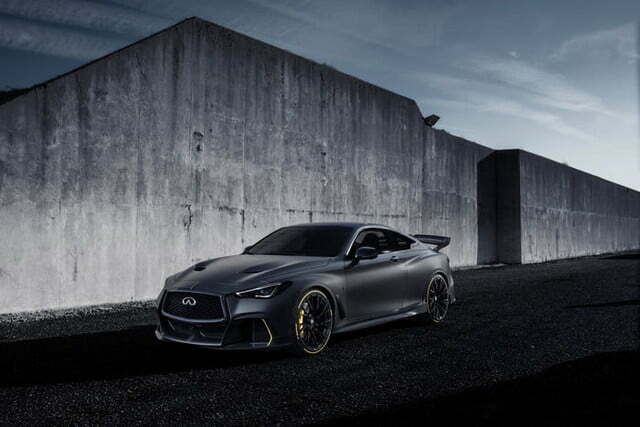 Infiniti refers to the Project Black S as a “prototype” rather than a concept car, indicating that it might be more than just auto-show eye candy. An Infiniti press release also said the automaker “believes there is potential for a new model grade” offering greater performance. But it’s unclear if Infiniti would actually put a car like this into production. When Infiniti was associated with the Red Bull Racing F1 team, it unveiled a high-performance version of the Q50 sedan called the Eau Rouge. Despite a positive reaction from enthusiasts, that car never went into production. 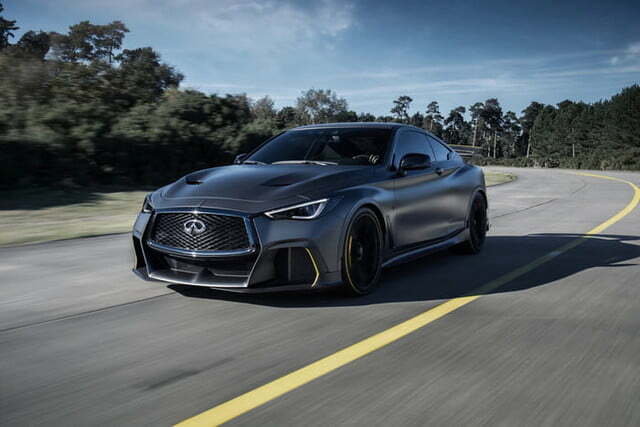 Infiniti currently lacks a challenger to the high-performance models from BMW M and Mercedes-AMG; maybe the Japanese automaker should stop teasing and actually build one. Infiniti does plan to build more hybrids, though. The luxury brand plans to offer a hybrid or all-electric powertrain option on every model by 2021. Updated on October 1, 2018: Added more technical details and photos.